Sometimes, if you want to understand the amazing things that happen in space, you have to make sense of them in a lab on Earth, first. Scientists are attempting to model some of the most powerful explosions in the universe by miniaturizing them into lab experiments. An international team of researchers made beams from a special kind of plasma (a gas where the charged particles are separated and not confined to atoms), called an electron-positron plasma. These beams seem to be creating strong, long-lasting magnetic fields. Perhaps these fields could help the researchers understand similar behaviors in much more violent systems, like the gamma ray bursts in deep space. The team used the intense Gemini laser at the Rutherford Appleton Laboratory in the UK, with a special setup for studying what’s called an “electron-positron plasma beam,” or EPB. They created this beam by passing an intense laser pulse through a chamber filled with helium, which creates a beam of electrons. These electrons hit a lead target, and out comes the EPB, a plasma that has equal amounts of electrons and positrons, their antimatter partners. If you’ll remember, every charged particle has an antimatter partner that’s (almost) exactly the same except with the opposite charge. The team has done this before. But here, they were able to actually make measurements of that EPB’s behavior, including the long-lasting magnetic field caused by it traveling through a background plasma (one consisting of electrons and charged atoms, or ions, instead of positrons), according to the paper published recently in Physical Review Letters. 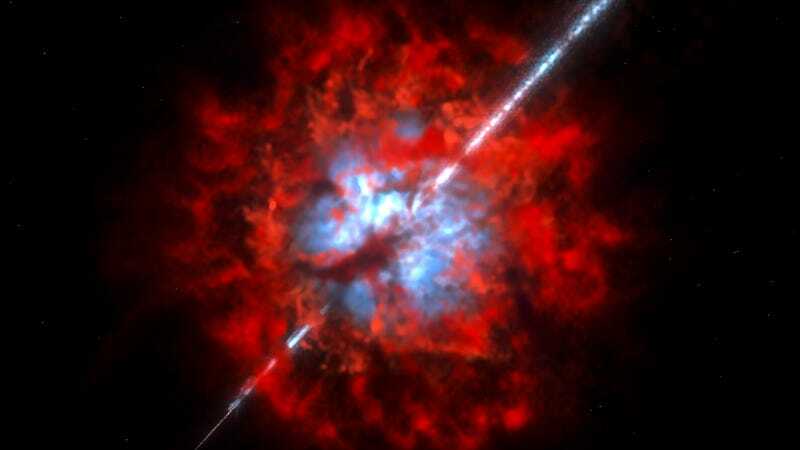 These phenomena can help explain how those gamma ray bursts form in astrophysical systems like black holes. Sarri explains that black holes create beams of these electron-positron pairs, which make their own magnetic fields, creating gamma ray bursts—similar to what they’ve done in the lab.